Lately, I’ve been seeing some Crock Pot Rotisserie Chicken Recipes floating around on Pinterest. Like many other things I see on Pinterest, I assumed this was too good to be true. 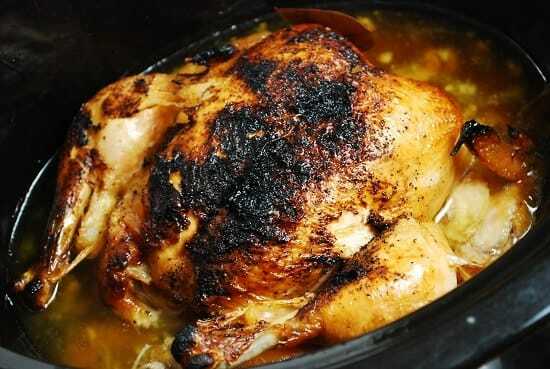 Succulent, evenly cooked, rotisserie style chicken from a crock pot? No way. But I adore rotisserie chicken, and if there was an easy way to make it at home myself without having to buy yet another appliance to fit into my already cluttered kitchen, well then I was game to give it a try. I reviewed a few recipes and notes, and created my own version. The key is to stick the chicken under the broiler first to crisp up the skin and seal in the moisture of the chicken. Then pop in in your slow cooker for the rest of the time to cook through. I was absolutely AMAZED at how good it turned out!! Seriously delicious. It was incredibly moist and juicy, and was totally falling off the bone. And it was way better than the rotisserie chickens I’ve purchased at stores or restaurants. From now on, this is the only way I’ll have rotisserie chicken – it was that good, people. Just note that the nutritional information and the Weight Watchers Points I’ve calculated for this recipe is based on the WHOLE chicken, with the SKIN REMOVED. I added up the stats from the entire chicken and then divided it by 8 servings. So, your Points may vary a bit, depending on whether you are eating breast, thigh, wing, etc. But most importantly, remove the skin! This will be one of the best Weight Watchers Crock Pot Recipes you’ve ever made. Now you can make your own rotisserie chicken at home with this amazingly good Crock Pot Rotisserie Chicken Recipe. No fancy equipment needed…just your slow cooker! The end result is a chicken so juicy and delicious you will never buy rotisserie chicken at the store again. In a small bowl, combine paprika, onion powder, garlic powder, and salt & pepper. Rub chicken all over with seasoning, and place in a shallow baking dish. Place chicken under broiler for about 10 minutes or until skin begins to darken and crisp. Remove from oven and transfer to crock pot. Add in broth and bay leaves, and cover with lid. Cook on low for 7-8 hours or high four about 4-5 hours. *The nutritional information and Points value may vary a bit depending on which parts of the chicken are consumed. The data I have posted here is calculated based on an average of the nutritional data for the whole chicken with the skin removed. I cooked this on low setting for seven hours and it looked delicious. But texture was so dry it had to be thrown out! It reminded me of an over-baked Thanksgiving turkey. I’m wondering if the problem may have been either the chicken or perhaps my low setting may not be low enough? Is there a way to check for accuracy of crockpot settings? This chicken looked great and tasted fantastic. Super tender. Yum! I made this it was great I used split chicken breast instead of whole chicken, my husband doesn’t like dark meat. Any suggestions on how to reheat it I had left overs? I am wondering what size chicken you should use? What’s the point of CRISPING the skin if you have to remove it, if you are on WW? I’m not on it, so I’ll eat it. Thanks! Just wondering if you take the skin off before you cook it, or after? After…it’s easier, and plus the skin helps the chicken meat retain its moisture while cooking. Definitely making- can’t wait!!! I am going to do like Nancy and try to make it a one pot meal! I assume you add the onion powder in with the paprika and garlic powder. I was wondering if you thought it would work if I added some carrots and potatoes to the crockpot to cook as well? I very rarely use my crockpot and thought that this would make a one dish meal. Would the juices from the chicken make the vegetables greasy?